Talk about a crowd pleaser! A massive number of Pokémon Go players stampeded through NYC’s Central Park on Thursday, July 14, after spotting a rare Pokémon in the public green space — and the stunning incident was captured on video. 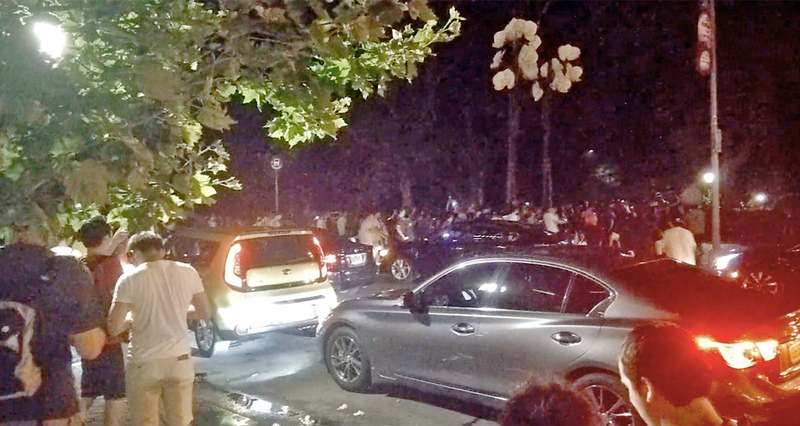 In a clip that has since gone viral, a crowd of earnest players who were all alerted that the super-rare Pokémon, a Vaporeon, was wandering around Central Park late Thursday night begin to swarm the spot. Several individuals even exit their cars in order to get in on the action. As a bit of background, Vaporeon are evolved Eevees, cute little fox-type Pokémon that evolve into eight different creatures. Meaning, if players truly want to capture all the Pokémon, they have to either capture eight different Eevees and evolve them in eight different ways, or capture the rare Vaporeon. Since its release in the U.S. on Wednesday, July 6, Pokémon Go has already amassed more than 15 million downloads on Apple’s App Store and Google Play, and the game has led to numerous odd incidents, including the discovery of a dead body and several robberies. One Indiana dog shelter has turned the app into a tool for good, encouraging Pokémon Go players to take their pups on much-needed walks while out in search of the digital creatures. On Saturday, July 16, The Independent reported that Pokémon Go servers were down, causing fans to panic. They were restored shortly afterward.